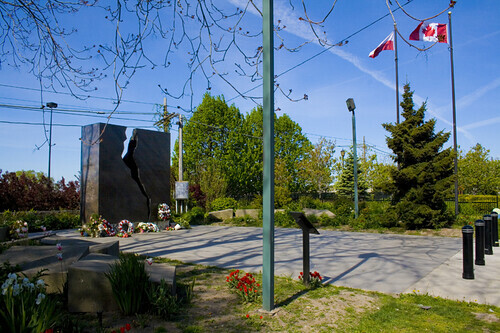 “Katyn Monument” by artist Tadeusz Janowski is located on the west side of town where King Street West becomes Roncesvalles Ave and Queen Street West becomes The Queensway. Located in a largely Eastern European neighbourhood, the large stone structure with a crack running through its centre initially led me to believe it was a tribute to the destruction of the Berlin wall. Upon further investigation I found that it was nothing of the sort. 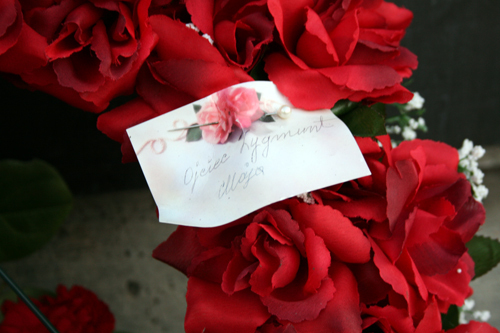 There are several monuments to the Katyn Massacre through out the world. The Wikipedia entry into the massacre can be found here, and an excellent article about the monument’s original font by Torontoist contributor Jake Bauming can be found here. The Toronto monument is made of bronze and was erected in 1980. Used to be European would be a more accurate description. There was some pro- Solidarity rallies there when the area was more Polish.